Click image to watch a video about the American kestrel nest box program. 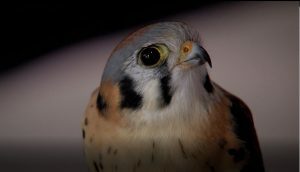 PHOENIX — Standing at less than 11 inches tall, the American kestrel is a mighty bird of prey, yet the future of this fierce little falcon is uncertain, as populations are on the decline nationally. “Our goal is to provide breeding habitat for this charismatic species and rewarding wildlife conservation opportunities for the community, while collecting valuable information to aid in future management decisions that benefit kestrels,” Licence said. American kestrels are North America’s smallest and most colorful falcon. They eat insects, small rodents, reptiles and birds. Kestrels can be found from Alaska to South America and prefer habitats with short ground vegetation and sparse obstructions.